Another year has come and gone, i’m taking a moment here to look back at what happened in 2009, what people want in Egypt, what they are looking for and interested in. Hotels remain in number 1 like 2008, Restaurants jump from 4th position to second position, Schools comes in the third place while Banks drop 2 places to be in the 4th place. Cars move out from the top 10 and Pharmacies enter in the 10th position. As for the businesses, HP retains its first place for the second year, DHL and Western Union comes in second and third places. 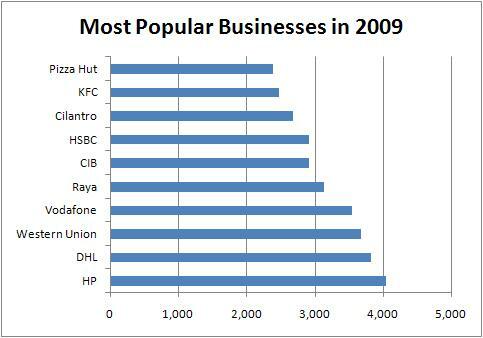 Followed by Telco companies Vodafone and Raya, as for banks CIB jumps this year above HSBC, and finally cafes and fast food restaurants appear for the first time in the top 10 list: Cilantro, KFC followed by Pizza Hut in the 10th place. 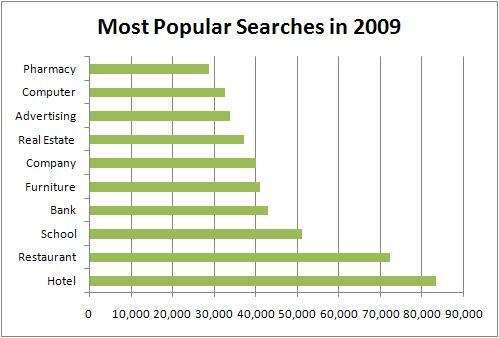 One more interesting fact is that Arabic version of www.yellow.com.eg is getting more attention, usage has increased from 40% in 2008 to 45.8% in 2009 almost reaching the English. 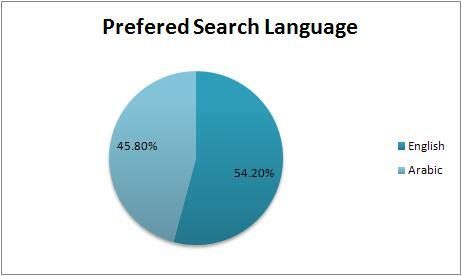 This is a direct result of enhancing the arabic search logic which now produces better and much more relevant results. 2009 was just a great year for Egypt Yellow Pages. 2010 will hopefully be even better, we will keep doing our best to serve our visitors and enhance their experience.